Posted in ~ Interview, ~Meta. Did The Lawnmower Man Ruin Everything? 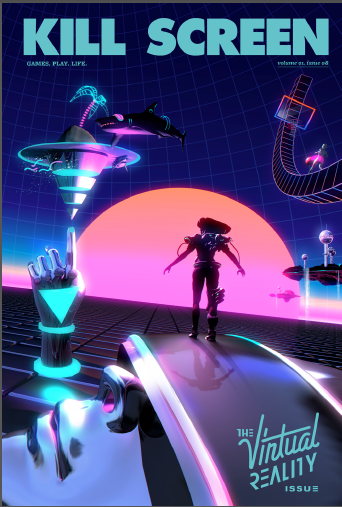 The “Black light poster rendered on a Mac Classic” that is the virtual reality sequences of The Lawnmower Man. It’s not online, so head to their website to find out the closest place to get your hands on some of that goodness yourself. Poached from information science, the term “problem closure” means that the way a question is asked limits how we might answer it. In other words, it’s that box we’re always trying to think outside of. But, like What You Know Plus One, problem closure has a social dynamic to it. Valid answers to questions may not be recognized as good answers if they venture too far outside of said box. Videogames like Rez drew against the image of virtual reality Lawnmower Man helped create precisely because of the way movies had already framed the question of what virtual space should look like. Usually games have to work with what we already know to teach us something we don’t. What brief did you receive? How did you interface with (director) Drew Goddard? COPLIN: The one thing I really remember was that the control room needed to have an older feel to it, like it had been set up years ago but still functional… a kind of a low tech mechanical feel with high tech functions. I remember referencing photos of security/surveillance control rooms that you would see in a prison guard station. I didn’t communicate with Drew directly. All notes got were filtered down from the on set playback operator and supervisor. CHRIS: When we started this project, design notes from Drew were given to our on-set playback supervisor Mike Sanchez in Canada, to relay to us here in the U.S. The notes said the control room is to look like its been there for a long, long time. As if they built this room with state of the art equipment years ago, but over time they have made some upgrades but kept the old stuff that still works there. So you could have a modern computer running software right next to an old light up panel with switches on it that work together. 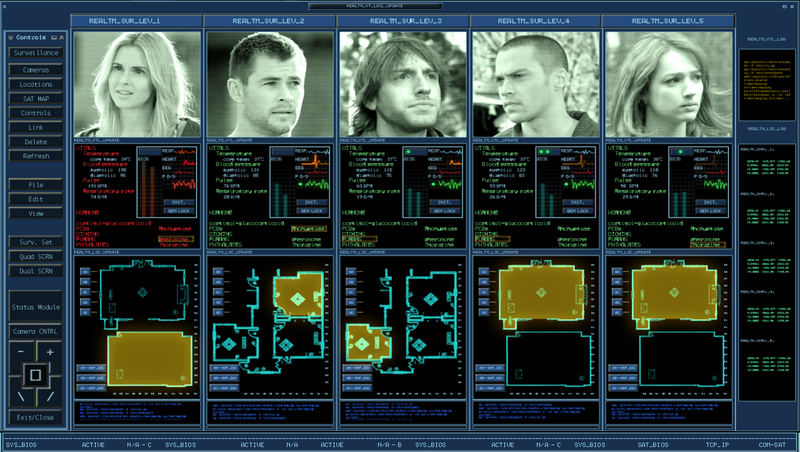 Tell me how you went about creating the interfaces for The Cabin the Woods? How did you handle the remote collaboration between you two? COPLIN: I started designing the interface with the idea that it was an older system set up, that might have looked high tech in it’s prime but had "weathered" a little bit. So I tried to add a lot of terminal and DOS style elements that would imply a lower, underlining level of programing. I also felt it needed to have a utilitarian and mechanical feel to the design as it would be controlling and monitoring the different parts of the house. Chris and I were in the same office, although we were balancing multiple projects together at that time. CHRIS: Coplin started the initial design on the interface, but we had a few variations of interfaces to make. I started designing different parts of the system like the video surveillance setup and background screens that included video oscilloscopes, code screens, door keypads, and a lot of surveillance on different monitors. The remote aspect came into play when things needed to get approved or changed. We would send the files to Mike in Canada for Drew to look at, and if changes were needed he would send us drew’s notes. So there was a delay sometimes in getting things approved which made it harder to get things made in such a short time. Were there any great ideas that didn’t make it to screen? What would you go back and redo given the opportunity? COPLIN: Looking back on this project, there were a lot of ideas that I’m glad did not make the film. After reading the review on your blog (a very humbling and at times embarrassing experience), there are plenty of changes I would’ve made. One in particular is the idea of making the deaths on the "kill" screen less noticeable as that information would be less important for their mission. There’s not usually a lot of time to spend on the details. My first requirement is to tell the story point efficiently and effectively as I can. I would have liked to have had more time think about the details of the designs. CHRIS: Yes, at one point we talked about having a monster select screen that showed all the monsters and their stats. That would have been fun to make but we were early in production and they hadn’t picked/designed all the monsters yet, so that was never finished. After I finish any project I learn so much and always look back and say I could have done this or that, but there’s never enough time. What are your backgrounds? Are you interface designers or SFX artists by training? COPLIN: I have a Bachelor of Arts degree in TV/Film Production from the University of New Orleans. After college I became a self-taught motion graphics artist. CHRIS: I have a BS in visual Communications, and an AS in Graphic Design. I started in print, designing packaging, advertising, and product design. I really liked animating graphics much more than print and so went in that direction instead. COPLIN: Time, as in all productions, seems to be one of the biggest challenges, as well as not physically being on set. I find being on set helps me with designing the functionality of the screens, to see how they will be set up in their environment and how the surrounding set pieces interact with them. Also it was very challenging for me to display a lot of "nondescript" information to make the screens look busy without tying that graphic to what ever pertinent plot point might be going on at the time. CHRIS: I agree with Coplin on this one. We only had a couple of days to design and animate all the screens for the main control set. That includes making changes on the fly. It does make it hard not being there, not being able to see the actual set and see how something looks on a monitor and being able to adjust it. Then we have the “make it bigger, and red or green” problems. This is when we have to make some text on the screen very large and red if bad and green if good. We try very hard to avoid things like that but sometimes it’s out of our control. They need to get a specific point across to the audience quickly, and even though your computer wouldn’t say something like "Access Denied" in RED 72pt FONT, some of these just might. 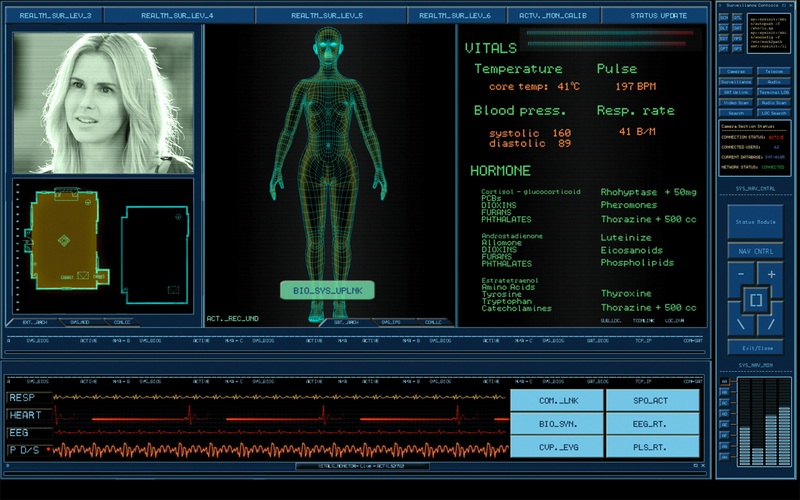 COPLIN: I guess I’m most proud of the "Penta-Vitals" aka "Marking the deaths" screens. They’re dense and busy but I feel like you could easily at a glance tell who was where and how they were feeling. CHRIS: I actually liked making the older electronic equipment screens. The oscilloscope, waveform monitors, were a challenge to make look real. I found making the older tech screens look real was a lot harder than I thought. The look and feel they had on those tube monitors is almost impossible to match on an LCD or plasma, but some we made for tube monitors. What’s your favorite sci-fi interface that someone else designed? COPLIN: Of course I’m a really big fan of Mark Coleran‘s work and the stuff that Ash Thorp, David Lewandowski, Jayse Hansen, and Bradley G Munkowitz do (to name a few). Anytime I see anything from those guys my mouth drops and I want to crawl into a hole. One of my favorite sci-fi interfaces is from Moon, It’s fun, clean and memorable. 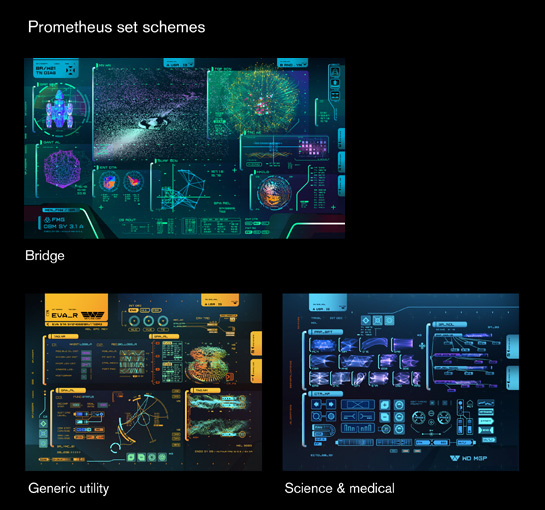 In your opinion, what makes a great sci-fi interface designer? COPLIN: I think what makes a great sci-fi interface designer is someone who can artistically tell the story and creatively display pertinent information in a clear and concise manner. Someone who can put themselves in the characters shoes and imagine what that character would want to see on the screen. CHRIS: I agree, a designer should find a way to solve a problem or create a user interface that is fast and relevant to the story while making it artistically appealing to look at. COPLIN: I’m hoping to continue creating interactive motion graphics for on-set video playback and post production. CHRIS: To continue working on interface design and animation for films and tv shows. Im starting on a new project right now designing a 3d Holographic navigational control system, and some HUDs for some space suits. Posted in The Cabin in the Woods (2012), ~ Interview.